The Canadian insurance industry saw a bit of an unusual catastrophe season last year, with more cats in the second quarter than the third, and Ontario beating out Alberta for insured losses. There were a total of 12 catastrophes last year (a catastrophe is an event that causes more than $25 million in insured losses), as well as nine notable events (insured losses of between $10-25 million). Twidle spoke Tuesday at the CatIQ Connect conference, held at the Metro Toronto Convention Centre from Feb. 4-6. By line of business, the proportion of insured cat losses in personal lines led the way as usual (at 64%), but commercial and auto lines were up as well (to 23% and 13%, respectively). The total insured loss mark reached $1.9 billion in 2018, but “with external expenses and notable events, this could be over $2 billion,” Twidle said. On July 13-14, softball-size hail and 105 km/h wind gusts hit central Alberta and Saskatchewan, this time mostly affecting Alberta. Insured losses were about $41 million. A record-breaking tornado in Manitoba occurred between Aug. 1-4. 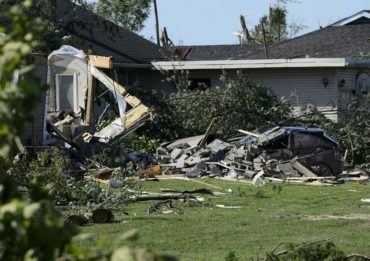 “[The tornado was] likely the strongest in the world, definitely the strongest in North America for last year,” Twidle said. Wind gusts of up to 280 km/h were recorded on Aug. 3 in Alonsa, Man. The last cat of the season occurred in B.C. on Dec. 20, with wind speeds up to 144 km/h. BC Hydro said the event was the most damaging storm in their history, with some customers losing power for over a week-and-a-half across the holidays. The event totaled $52 million in insured losses.